Two different U.S. broadband goals were laid out this month. The Federal Communications Commission chief called for connecting 100 million households at 100 megabits per second. But Google stole his thunder last week, promising to bring eye-popping speeds of 1 gigabit per second to thousands of Americans. Coming days before the FCC was originally meant to deliver its National Broadband Plan to Congress — a deadline that has since been pushed back — the announcements may give hope to U.S. consumers, many of whose next-generation smart phones, netbooks and home entertainment systems are limping along on broadband networks that wilt when compared to those in other countries. That comparison was cemented Tuesday by the release of an exhaustive review of America's broadband system — and its foreign counterparts — by Harvard's Berkman Center for Internet and Society. 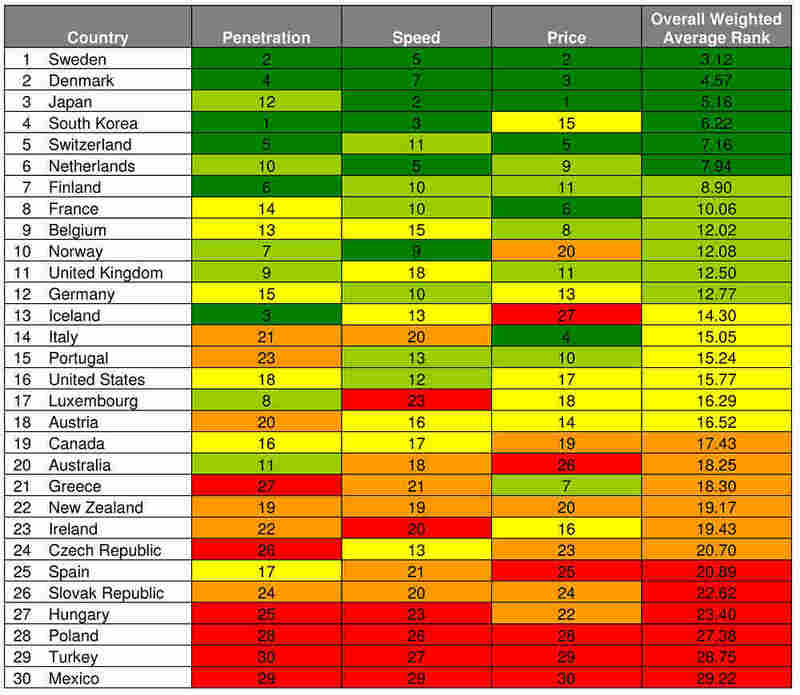 Lost In The Middle: The strength of developed countries' broadband networks, ranked by weighted aggregates. You would not win any prizes for guessing that in the broadband game, the United States is getting creamed by other developed countries. But the new FCC-commissioned report draws the picture very clearly — in fact, at 333 pages, it practically gives a 3-D model of what's wrong with America's broadband system. From bureaucratic and legal missteps to abnormally steep prices, the report has few bright spots, and many details that might anger or amaze anyone who's ever stared at their phone as it downloaded a Web page — only to have the network crash altogether. After the jump, a sampling of highlights from the report. Big Surprise: South Korea For starters, it's the world's only country where 100 percent of mobile phones subscriptions are 3G. And since the end of 2007, more than a third of South Korean Internet connections have been via fiber optics. South Korea's current goal? Offering the entire population access to fully converged wired, wireless, and RFID (Radio Frequency ID) networks via mobile and fixed devices. In other words, true seamless connectivity. Surprise Loser: Canada Yes, the Great White North has extended broadband to a high percentage of households — a key measuring stick and a very measurable goal — but it also has high prices, slow speeds and unimpressive 3G presence. So, Canada doesn't look as good as it often does in similar international surveys. But the report also referenced how far both Canada and the United States have slipped. As it says, "In 2001 and 2002... the United States had the fourth highest level of broadband penetration, while Canada had the second highest." First, a new guard at the FCC welcomed the new millennium by stripping a forward-looking telecommunications bill of key measures. And the Supreme Court sided with entrenched phone and cable companies, who were squabbling about sharing their networks. The market was competitive enough, the FCC and the justices decided, with the existing companies using their proprietary networks to vie for customers, via either phone or cable lines. The report uses some very diplomatic language to say, in the nicest possible way, that those decisions culminated into one expensive and punishing mistake. The Synthesis The panel's review "suggests that the original judgment made by Congress in the Telecommunications Act of 1996 represented the better course.... [Open] access policies... seriously implemented by an engaged regulator, contributed to a more competitive market and better outcomes. In turn, these policies... now form the basis of much forward-looking planning throughout the world." America: Highs And Lows In terms of speed, you can find it in all flavors in the U.S. — from the slowness of below 1.5Mbps to the perky 35Mbps and up. And in terms of pricing, the slower services net a highly competitive low price, in the world view. But if an American wants speeds of 35Mbps and up, it'll cost more than it would in any other developed country. As a random example, a connection speed of 35-50Mbps via Verizon's acclaimed FiOS service will run you around $140.00. In Japan, you can get 160 Mbps service from J:Com — a company controlled by the American-owned Liberty Global — for around $60. 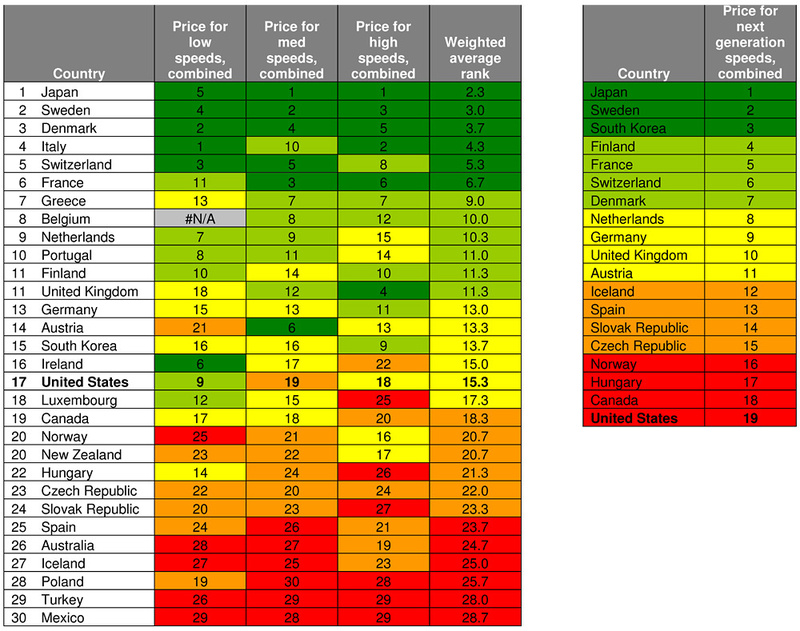 Speed Is Money: Countries ranked by their average prices for current (left) and next-generation (right) broadband speeds. The report says the United States began the 21st century "in the top quintile in penetration and prices, and has been surpassed by other countries over the course of the decade." In the context of that statement, the two reasons often cited for America's paltry broadband offerings — that the nation's sturdy landline network cramped competition, or that its large size is a hindrance — begin to lose credibility. The Future Sure, the U.S. has suffered from its bad choices. But there's help on the way. Most prominently, the Obama administration's stimulus package aims $7.2 billion at broadband, which is on par with, or above, our better-connected peers' investments. The exceptions are Australia and New Zealand, whose governments are diving into a broadband spending spree. And Japan and South Korea offer a glimpse at what America's broadband future what might look like. Basically, we should expect to start hearing a lot about convergence. Those two countries have allowed their wireless carriers to fully integrate with fixed-line providers — as long as the mobile carriers also open their data networks to their competitors. But those things happened only after South Korean and Japanese wireless carriers had reached a level of network maturity and saturation — something U.S. firms are only now approaching. It is worth noting that in his speech Tuesday, FCC Chairman Julius Genachowski called for improving America's broadband to the tune of the oft-cited "100 Squared" plan — to connect 100 million households at 100 megabits per second. Genachowski called broadband an engine for job creation and civic engagement. "And the time to get to work on that engine," he said, "is now." The FCC, which was unable to meet its original deadline of Feb. 17, is slated to present the details of its plan on March 17.